Denny Jump (Bellevue, WA, United States) on 25 October 2018 in Plant & Nature. This image shows a portion of the Huge Jade Plant that graces the front are of our son and daughter-in-law's home in Vallejo, California. 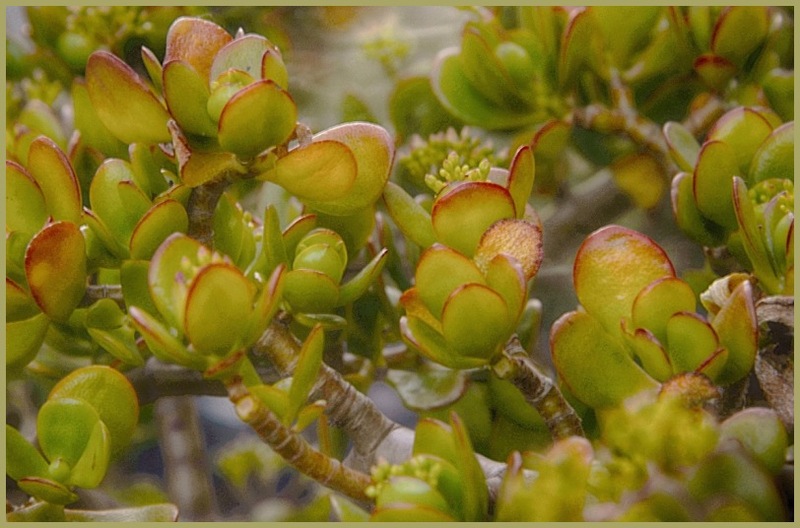 Jades are absolutely beautiful, in my opinion..and they grow for years and years, if kept well.....One word of Warning, however: The Jade "leaves: are highly toxic to cats, if eaten, so keep them away. Interesting and non trivial pattern. Excellent focusing bringing out nice detail and color on the plant. Interesting story from the Jade . Beautyful photo with many nice details . These are beautiful plants that I had forgotten about. Gorgeous photo. @Steve Rice: Thank you, Steve...Yes I really love these plants..This one is probably 30 years old !! Great capture of this jade plant with its shiny, waxy lobes!! An interesting variety with the red that outlines the lobes. It is gorgeous! I love the colors. I have some darker leafed jade plants but this one is just beautiful!